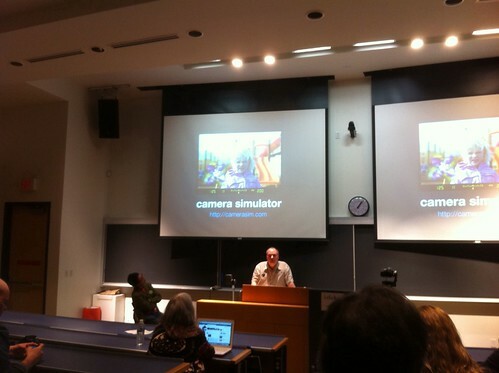 I really enjoyed attending photocamp at Northern Voice this year. John Biehler is a great presenter, very easy to understand and unintimidating. Lots of folks attending had SLR cameras. I had my point and shoot panasonic and my iphone. Still I got a lot of inspiration and some good pointers. Camerasim is a great web tool to simulate taking photos with different SLR settings. I downloaded instagram on to my iphone and love how easy and fast it is to take and share cool photos. I very much enjoyed attending Northern Voice again this year. Arriving at the conference Friday, I was a little taken aback that a hashtag had stolen the marquee spot on the official t-shirt but I guess change needs to be embraced. I will miss new editions in the "bloggable" series of tees, but I'm happy that an almost complete set of that series graces my clothing closet at home. April Smith kicked off the conference on Friday with an awesome keynote about her work using social media, most notably smartphone video, to bring attention to the stories of residents of Vancouver's Downtown Eastside. Her work is touching and inspirational and April comes across as such a positive can-do person. April herself is a resident of the Downtown Eastside and has lived on a very modest income. Her Northern Voice talk has got me thinking about work for which I could use her company, Aha Media. I can only assume others are thinking the same. 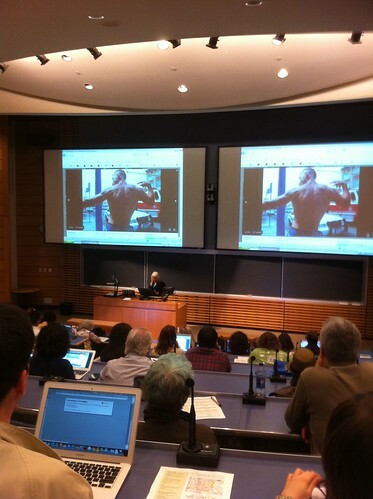 I also attended 11 other sessions at Northern Voice 2011. Will blog about those in the coming days. Wow! That was some election last week. Congrats to the Conservatives, the NDP, and the Greens on their successes. Good luck to the Liberals as they rebuild. I really had hoped for a better result for the Liberal Party. I have been quiet here because I am in the last throes of my MA thesis. Heading to the Northern Voice conference in Vancouver on Thursday evening and have many many pages to draft before then.